This Slow Cooker Posole (or Pozole) is a traditional Mexican stew made with hominy and pork and a flavorful broth that’s super easy to make! It may be officially spring, but here in New England, this season could mean 65 degrees one day and snow the next! For the chilly transitional days, this Slow Cooker Posole, a traditional Mexican stew, will help thaw you from the inside out. Posole (aka Pozole) is full of warm flavors and has a kick of spice. Best of all, just throw the prepared ingredients together in a slow cooker, and you’ll have a hot, hearty meal ready by dinnertime. One important thing to remember is that you have to plan on making your stew the day before. After marinating together for several hours, all those zesty flavors blend together and marinate the meat, making the stew extra flavorful and the pork nice and tender. In the removable insert of your crock pot, combine the pork, chicken broth, hominy, salsa, garlic, and a handful of Mexican spices, and let the mixture sit in the refrigerator overnight. The next day, you can toss it in the cooker! The end result is a rich pork posole that’s like comfort food in a bowl. Garnished with fresh cilantro and tortillas, this authentic Mexican meal will transport you to the tropics! Sometimes I like to switch up my garnishes, and having a variety means that everyone can customize their bowl of stew exactly how they like! Try mixing and matching lime wedges, jalapenos, crunchy tortilla strips, avocado slices, pico de gallo, cotija cheese, or queso fresco! 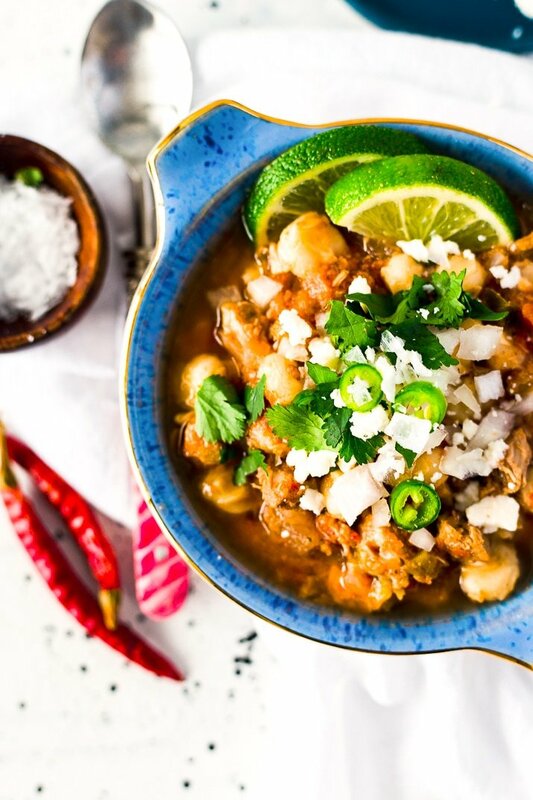 And if you’re planning on celebrating Cinco de Mayo this year, this traditional Posole recipe is the perfect dish to make for friends, family, or just yourself! Did I mention it tastes amazing with Margaritas? One thing love about soups and stews is that they taste just as good (or better) when they’re enjoyed as leftovers the next day! 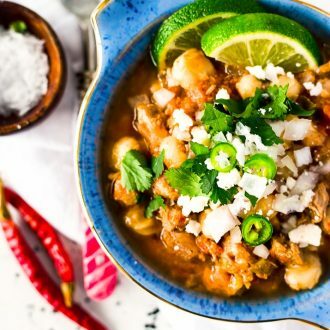 This crock pot Posole is perfect to pack for lunch with a side of tortillas or to heat up for a quick bite at home. 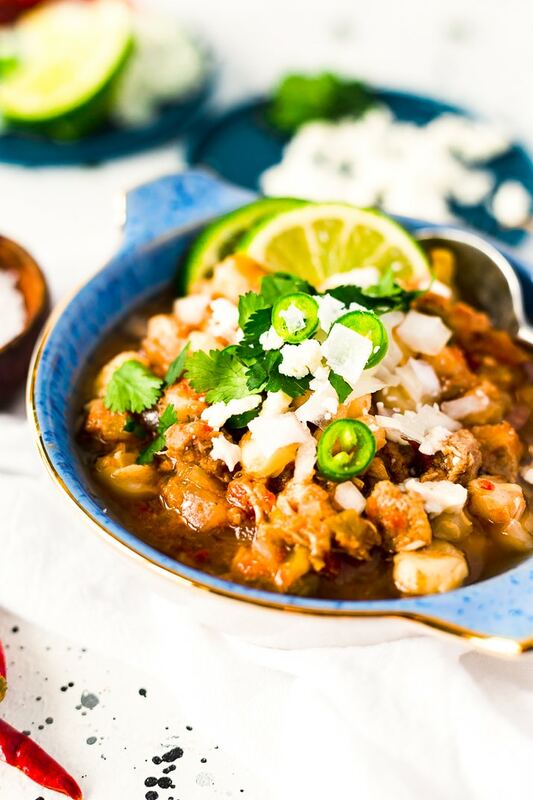 If you’re looking for an authentic way to reign in Cinco de Mayo or you just love having easy, delicious recipes on hand, try this stew recipe for a hearty meal that will satisfy your Mexican cravings! What Kind of Meat is in Posole? Traditionally, pork is used, but you could definitely do chicken too, just toss in a pound of chicken breast and cook according to the directions, shred the chicken before serving. In most regards, yes. It’s a low-carb, low-calorie meal and hominy is said to have a lot of nutritious attributes. Pin this Mexican Stew for Later! 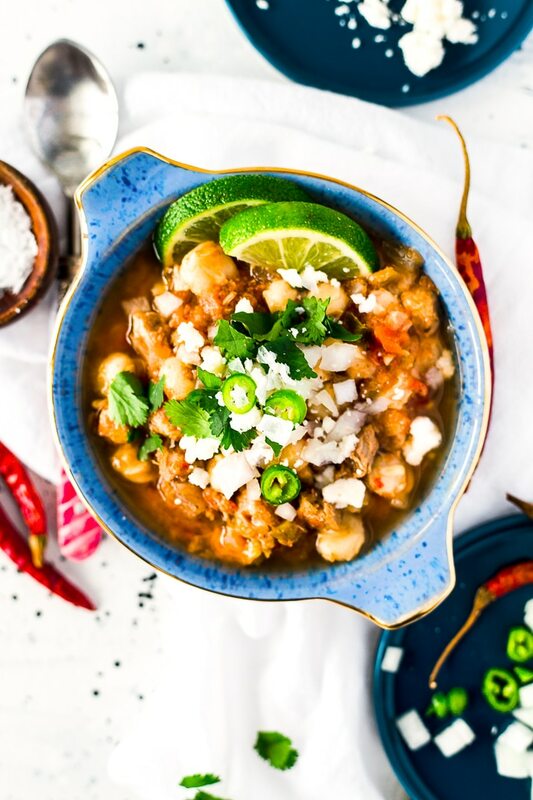 This Slow Cooker Posole (or Pozole) is a traditional Mexican stew made with hominy and pork and a flavorful broth that's super easy to make! The night before cooking, combine all ingredients except for the salt, pepper, cilantro, and tortillas in the removable insert of the slow cooker and refrigerate overnight. The next day, let the insert set at room temperature for 30 minutes before cooking or dump the bowl into the insert to begin cooking right away. Cover and cook on low for 6 to 8 hours or high for 3 to 4. Ladle into bowls for serving and garnish with chopped cilantro and serve with tortillas. I just love this recipe! It’s healthy, low carb and completely delicious. Making it in the slow cooker makes it super easy – love that! Great recipe & i love all your garnish suggestions. The only trouble is I want them all. I’m making this tomorrow, so I mixed all the ingredients tonight. It doesnt seem like enough liquid. Will it be soupy after it cooks? Hi Haily, Posole is more of a hearty stew than a soup, if you want it to be a little thinner I would recommend adding more chicken broth/stock.